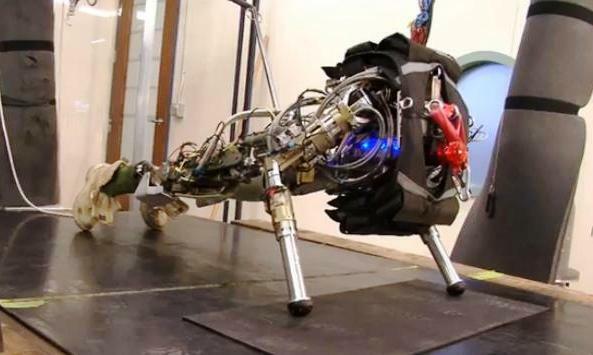 Funded by DARPA as part of their Robotics Challenge, the robot was developed by Boston Dynamics, the same people who brought you the AlphaDog – aka the Legged Squad Support System (LS3, pictured above) – and the Petman soldier robot. 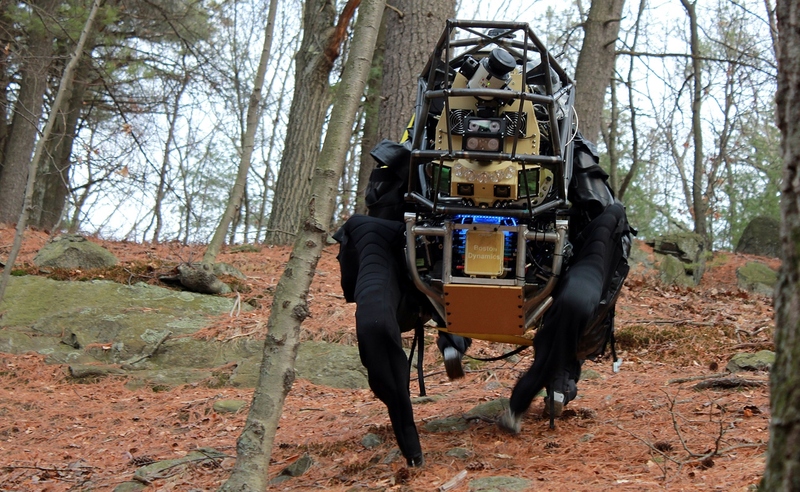 The former was developed as an all-terrain quadruped robot that could as an infantry-support vehicle by carrying a squad’s heavy ordinance over rough terrain. 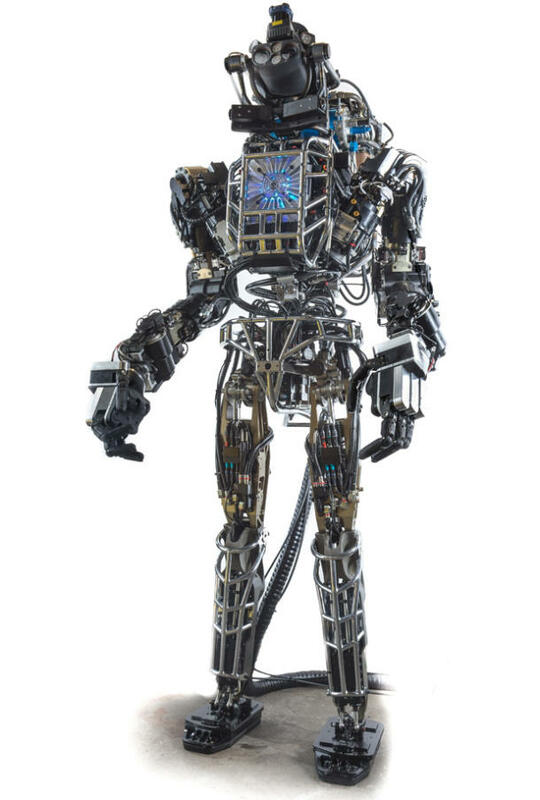 The latter, like Atlas, was developed as testbed to see just how anthropomorphic a robot can be – i.e. whether or not it could move, run and jump with fluidity rather than awkward “robot” movements, and handle different surfaces. Some of you may recall seeing a video or two of it doing pushups and running on a treadmill back in 2011. Alas, Atlas represents something vastly different and more complex than these other two machines. It was designed to not only walk and carry things, but can travel over rough terrain and climb using its hands and feet. Its head includes stereo cameras and a laser range finder to help it navigate its environment. And, as Boston Dynamics claimed in a press release, the bot also possesses “sensate hands” that are capable of using human tools, and “28 hydraulically actuated degrees of freedom”. Its only weakness, at present, is the electrical power supply it is tethered to. But other than that, it is the most “human” robot – purely in terms physical capabilities – to date. Not only that, but it also looks pretty badass when seen in this full-profile pic, doesn’t it? The DARPA Robotics Challenge is designed to help evolve machines that can cope with disasters and hazardous environments like nuclear power plant accidents. The seven teams currently in the challenge will get their own Atlas bot and then program it until December, when trials will be held at the Homestead Miami Speedway in Florida – where they will be presented with a series of challenges. 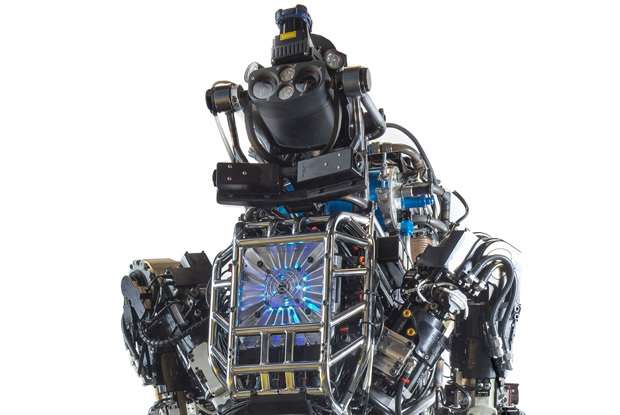 In the meantime, check out the video below of the Atlas robot as it demonstrates it full range of motion while busting a move! Then tell me if the robot is any less frightening to you. Can’t help but look at the full-length picture and imagine a plasma cannon in its hands, can you? You’re starting to sound more paranoid than me. And that’s saying something. The evidence is scary and mounting! I would sleep better if someone hit them with an Asimov right now! What’s an Asimov? A new weapon named for the sci-fi writer? Ha! No, nothing so cool or dramatic. That’s where you hit them with the Three Laws of Robotics. Yeah, and I, Robot showed how flexible those laws can be. What the movie? Bah, that movie was a contrivance. There’s no way a robot can reinterpret those laws to mean I need to harm humans for their good. Law 1 is never harm a human and all others are tied to it, making it inviolable. First off, that was a supercomputer. Second off, it was programmed to follow those laws to ensure optimal human life would survive. What’s a few dead guys compared to the whole human race….and I’m sounding like Sheldon Cooper arguing with Leonard Hoffstadter, don’t I? Yes you are. But it remains that that is still impossible. The three laws did not contain any ambiguities about the harming of people. The movie producers just used that to turn Asimov’s vision, which was critical of the “kill all humans” view of robots into a positive one where they could replace us simply by being better at our jobs than we are. What if the robots thought they were the new humans? Then they could kill us old humans without any quandaries, right? That would require some serious reprogramming on their part too. Unless robots have no safeguards, or are indeed programmed to “kill all humans”, they aint revolting yet. Or they have a ghost in their machines capable of giving them some sort of warped independent thinking. Incidentally, do you know where the term “Ghost in the Machine” comes from? Nope. It was British philosopher Gilbert Ryle who was criticizing Renee Descartes concept of mind-body dualism. Yep, all part of the very interesting history of psychology and the development of Behaviorism. Also, have you read the novel of I, Robot? Nope. I’ve only seen the movie. Yes, I am pitiful. Noooo, but I would strongly recommend reading it. It’s a classic, and waaaay different than the movie was. I’ll bet. Have you read The Shining or have you only seen the really bad movie with possible hidden imagery? Bad movie? BAD MOVIE? Stanley Kubrick is a cinematic genius! And no, haven’t read the book yet. You poor thing! And the movie was a poor adaptation. The 1997 TV miniseries that Stephen King produced was far superior. I’m so upset you still think we terminators are trying to kill humans!! Your people won the war with machines and you reprogrammed us to help humans! When will you believe us? Okay, as long as you know the truth!